For the past two decades, J. Frank Schmidt & Son, a wholesale tree grower in Boring, Oregon, has championed this simple saying: “Trees are the answer.” More than just a bumper sticker slogan, this message is loaded with sales potential. Sure, trees are the basis of landscape designs and provide immeasurable beauty. But they do much more than just that. Recent research affirms that trees also account for quantifiable, verifiable monetary value by mitigating environmental, economic, health and societal problems, especially in the urban environment. The diverse benefits of urban forestry are increasingly being accepted and put into use. Consequently, local, regional and national efforts are encouraging people to plant more trees — and helping them do it, too. Growers and garden centers are slowly joining the movement by showcasing trees as viable — and vitally important — options for property owners of all persuasions. “Researchers continue to discover new benefits of trees in the urban environment, and these ideas are starting to bump up against other fields, like human health care,” Ries explained. As an example, Ries cited a 12-city study by Dr. Vivek Shandas of Portland State University, which examined the benefits of urban trees to reducing asthma rates. And that’s just the start. Nancy Buley, communications director at J. Frank Schmidt & Son, has gathered an array of resources and links to empirical evidence about the benefits of trees and compiled them on a website — www.TreesAreTheAnswer.info, a treasure trove of information that tree proponents can use to convince people of the value of planting more trees. Buley was honored in 2014 by the Arbor Day Foundation for her lifelong commitment and outstanding contributions to tree planting, conservation and stewardship at the state level. She works closely with research scientists, horticultural experts, urban foresters, landscape architects, Friends of Trees and other organizations that promote the importance of trees. Buley pointed to research by the U.S. Forest Service (USFS), which over the past 20 years has measured and evaluated the specific benefits that trees bring to the urban environment. Estimates of the potential savings from planting trees in available spaces around American homes and businesses come in at over $4 billion each year. “We as growers should be educating city and other government agencies about the value of trees as infrastructure,” Buley said. Stephanie Mack, tree and shrub buyer at Portland Nursery, concurred. At Portland Nursery’s two retail locations, blooming trees and other plants are moved into seasonal displays where customers can see them as they enter the grounds. “If people see trees in bloom around town, they will see them when they get to the nursery too,” Mack said. Another way Portland Nursery educates the public is on its informative website (portlandnursery.com). Web pages on plants and monthly gardening tips provide information on an ever-growing assortment of tree genera. Customers can also access a tree selection guide, a photo guide of featured trees, and numerous links to other resources, such as the list of street trees accepted in Portland. Homeowners who are considering the value of adding a tree might also try the free suite of i-Tree tools developed by the U.S. Forest Service. The website — www.itreetools.org — lets people look up their property online, pick out an appropriate tree, “plant” it virtually, and calculate the savings the tree will generate over time. 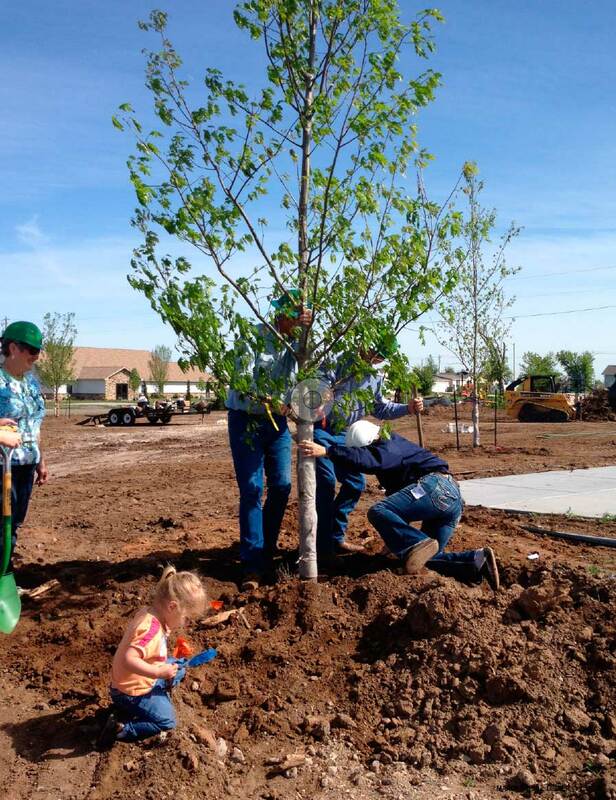 Volunteers from the nursery industry are a great way to support organizations that educate about the value of trees and promote community tree planting. Friends of Trees (www.friendsoftrees.org) and Alliance for Community Trees (actrees.org) provide property owners with step-by-step instructions, from picking appropriate street trees to permitting, utility location, tree delivery, hole digging, proper planting techniques and follow-up advice. The goal of Friends of Trees is to make tree planting as easy as 1-2-3. They offer a service where a representative will inspect and permit a property. All the homeowner has to do is pick a tree — they will even come out to help plant it on the neighborhood’s planting day. And this year, as part of its 25th anniversary, Friends of Trees is offering street trees for just $25. Since 1991, Portland’s Bureau of Environmental Services has worked on multiple fronts to improve wastewater management, since the existing system was ineffective and costly. One solution adopted by the city was to take the pressure off rivers by reducing the amount of stormwater entering the system. How? By adding green infrastructure, including trees. Trees intercept rainwater before it washes over sidewalks and streets into storm drains and pipes. Trees help filter rainwater into the ground, and they release moisture back into the air by way of evaporation and transpiration. Many parts of Portland are already lush with trees. According to the Urban Forest Canopy Report 2007, Portland’s urban forest included 236,000 street trees, 1.2 million park trees, and innumerable private property trees. In the years since that report was compiled, the bureau’s Tree Program has identified more than 130,000 empty locations in the city’s right of way — the area between the sidewalk and curb on city streets — as places where shade and other benefits can be realized, Karps said. In addition, the Tree Program seeks to spread trees equitably throughout the city, so areas with less tree canopy, especially in low-income neighborhoods, take priority. The Tree Program conducts outreach efforts, going door to door in targeted neighborhoods to encourage people to consider adding trees. Portland’s Treebate program has proven to be an effective way to convert hesitant homeowners into tree planters. The city has added more than 37,000 trees since 2008 by utilizing a long-term contract with Friends of Trees and on-call landscape contractors. Treebate offers a monetary incentive to plant trees on residential properties in Portland. The program pays back homeowners who plant eligible trees on residential properties before April 30, 2015. A Treebate for up to half the cost of a tree comes off the homeowner’s utility bill (some restrictions and limitations apply). Qualifying trees have to be at least 1-inch caliper and 6 feet tall. The mature size of the tree and expected impact on stormwater runoff determines the amount of the rebate: the larger the tree, the larger the rebate.